I was disgusted when I learned $100m was spent by Family Radio on the Doomsday/Rapture ad campaign that announced that the rapture of the church would occur last Saturday. Apparently Harold Camping, the 80 year old false prognosticator, dogmatically believed a deception and spent a lot of money trying to convince others to embrace his dogmatism. It made me think about how dogmatism can so lack humility. I have been around prophets in Charismatic Churches for a long time - for many years I spoke in a prophetic fashion in front of thousands at church. Mostly I spoke words of encouragement but on one occasion I predicted that a new church building would be a blessing to our grandchildren's grandchildren. I am embarrassed about saying that. I was so arrogant back then. 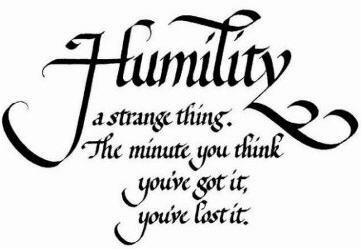 I guess that is what I see a lot in prophetic circles - a lack of humility. The people who speak prophetically often speak in very dogmatic language. Many times there does not seem to be an ounce of humility in their voices. They see the world in black and white ways. Their prophetic language reflects those narrow perceptions. On the flip-side I do believe in that spiritual gifts are for today when they are exercised with love and humility. I also see this lack of humility displayed by dogmatic pundits, teachers and preachers. These folks often display narrow dogmatic beliefs about political candidates, 'scientific' theories and pet religious doctrines. Their lack of humility is often demonstrated by the way that they describe alternate views. Sometimes they demonize people and views that they do not agree with. When I hear the I think of people like Harold Camping. Have you ever been put off by dogmatic pundits, teachers or preachers? I would have to agree with your assessment of dogmatism. There are a few basic issues I am convinced we must stand firm for, but there is much beyond that which calls for humility. I too believe believe in the continuance of the spiritual gifts. But I have found when I start becoming proud and trusting in my abilities rather than God I end up off on the wrong path. @Mike - Love the idea that agreement should be around the essentials of the faith and charity around all else.